Here in Massachusetts, every third Monday in April is designated Patriots’ Day, a state holiday commemorating the 1775 Battles of Lexington and Concord which gave birth to the American Revolutionary War. The annual Boston Marathon is run on this day, as well as an 11:00AM Boston Red Sox game, so it’s a pretty big deal in this neck of the woods. 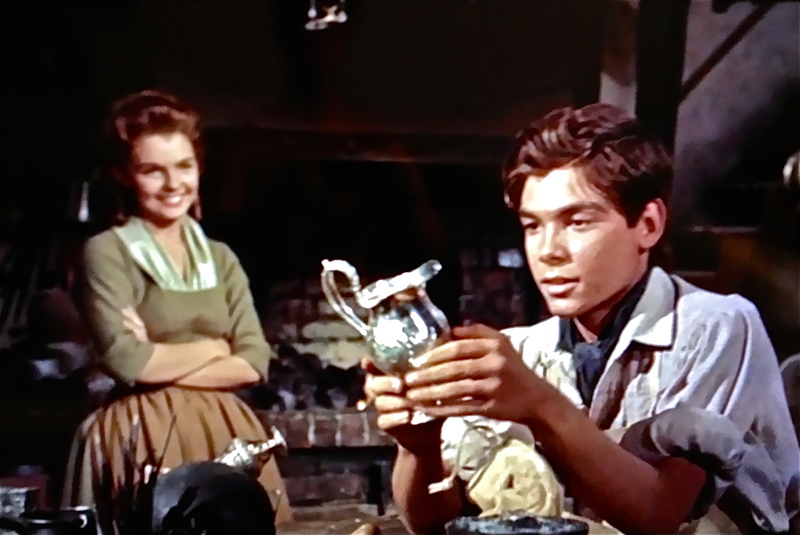 Those of you in other parts of the country can celebrate by watching JOHNNY TREMAIN, Walt Disney’s film about a young boy living in those Colonial times that led up to the birth of “a new nation, conceived in liberty and dedicated to the proposition that all men are created equal”. 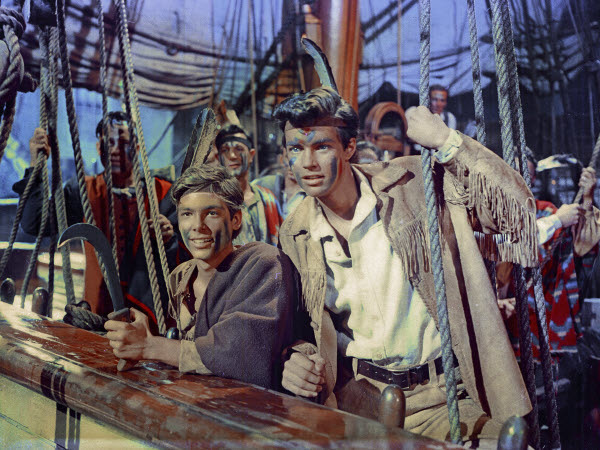 Based on the 1943 Newbery Award-winning YA novel by Esther Forbes, the film tells the story of the Revolution through the eyes of young Johnny Tremain (Hal Stalmaster), a teen apprenticed to silversmith Mr. Lapham (crusty Will Wright ), who has a cute daughter Priscilla (Luana Patten). When the aristocratic merchant Jonathan Lyte (eloquent but arrogant Sebastian Cabot ) brings in his silver tea-pot demanding a rush job, Johnny shares a secret with Cilla: his christening cup, given to him by his late mother, bears the Lyte family crest. When Johnny diligently works on the pot during the Sabbath (how blasphemous! ), his hand is burned, permanently damaging it and his apprenticeship in the process! Unable to find work because of his injury, Johnny goes to Lyte for help, and instead is accused of stealing the christening cup and arrested! He’s put on trial, and defended by Josiah Quincy (Whit Bissell ), a leader in the secret “Sons of Liberty” society. Cilla’s testimony sets Johnny free, and he’s recruited by the Sons as a messenger, playing an important part in the Boston Tea Party, then again by delivering the famous message to the church sexton (“Two if by sea”) that triggers Paul Revere’s midnight ride, leading up to the Battle at Lexington Green and “The Shot Heard ‘Round The World”! The cast includes Richard Beymer as Johnny’s pal Rab, Virginia Christine as Mrs. Lapham, Walter Sande as Paul Revere, Jeff York as James Otis (who gives an impassioned speech on fighting tyranny at the Sons’ secret meeting), Walter Coy, Cyril Delevanti, Gavin Gordon, Dabbs Greer , and Lumsden Hare. 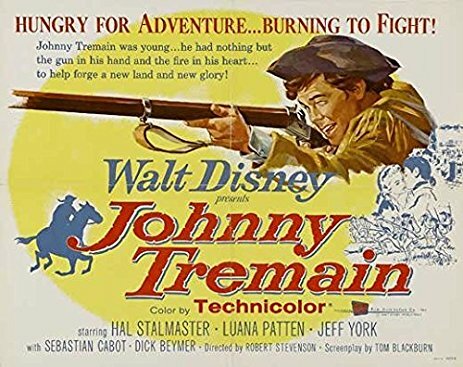 So today would be the perfect day to watch JOHNNY TREMAIN and celebrate liberty and freedom; as for me, I watched it last week, and since the Red Sox game has been cancelled due to our crummy New England weather, I think I’ll start my day by watching yet another movie! 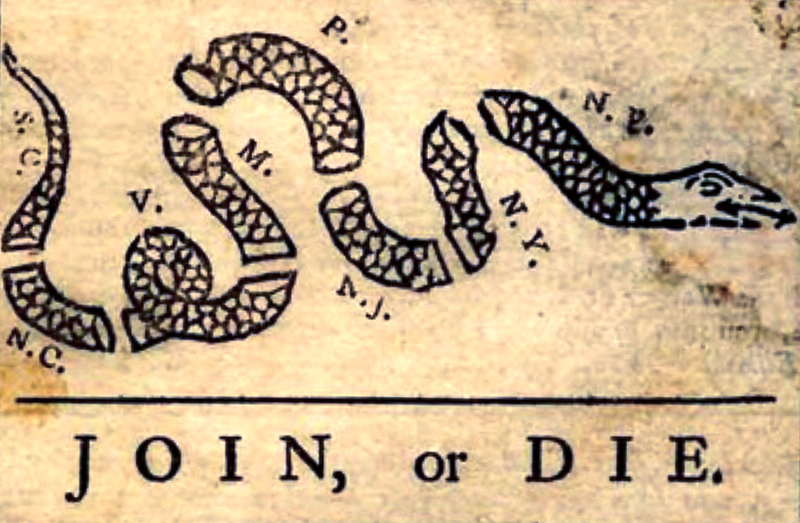 Happy Patriots’ Day, one and all! BTW, this year Patriots’ Day happens to fall on another celebration – my birthday!! Next PostNext Pulp Fiction #2: The Man of Steel Turns 80!